With an impressive mixture of culture, man-made treasures, and natural beauty, Kathmandu is referred to as a “Living Cultural Museum”. It is the most used entry point for the Himalayan destinations of Bhutan and Tibet. As of another third world urban center, Kathmandu has a problem of over population, pollution and chaotic traffic but the back streets and country roads inside the valley are still remarkable and provides sanctuary to the visitors. The old town is focused around Kathmandu Durbar Square. This is where the kings used to be crowned and is one of the must see place in Kathmandu. The fascinations here are the old royal palace, “Kumari” the living goddess, statues, temples, vegetable vendors and street hawkers. Just a kilometer away from the center and on the hilltop is Swayambhunath Stupa. This site is popularly known as “Monkey Temple” due to a large concentration of Monkeys throughout the area. From the top, you will have a bird’s eye view of Kathmandu Valley. It is one of the instantly recognizable symbols in Kathmandu. Most sacred Hindu Shrine of Pashupatinath is one of the must-see attractions in the valley. It is truly a magical place and is the largest temple complex in Nepal. Although Non-Hindus are not allowed to enter the temple premise lot can be seen from across the Bagmati River. Bagmati sacredness makes Pashupatinath Nepal’s most sacred cremation site. After the bodies are burnt the ashes are thrown into the river, where they are carried down to meet the Ganges. See the cremation going on the banks of Bagmati river. Once a powerful and an independent kingdom, Patan is the oldest city in Kathmandu valley. This “City of Beauty” still remains a city of artisans. Patan produces much of the Nepal metal works Patan long has had a Buddhist influence. The heat beat of Patan is Patan Durbar Square which holds the finest collection of Newari architecture. Bhaktapur also known as Bhadgaon is the third major town in the valley. The cobblestone street links a string of monasteries, temples, courtyards, and squares. The cultural life of the town is very vibrant with communities of potters, woodcarvers, and weavers. The Durbar square here is much larger than Kathmandu and Patan Durbar Squares. Bhaktapur remains one of the Nepal’s greatest treasures. 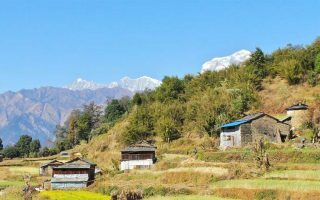 30 km from Kathmandu is a hilltop village of Nagarkot, which offers an enthralling view of various snow peaked mountains including Mount Everest (on a clear day). This hill top village also offers breathtaking views of panoramic landscapes. You may walk around the village to experience the local culture and life styles. Kathmandu Valley still retains an unfolded treasure to lure travelers again and again.